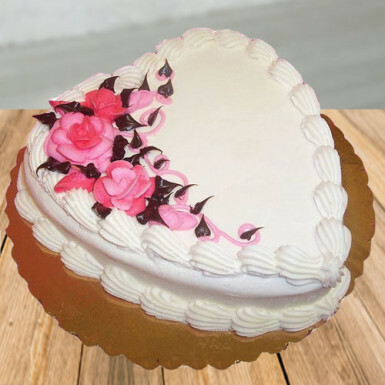 The heart shape of the cake expresses your heart-melting emotions for your special one. This pineapple heart shape cake is perfect for Valentine day gift. The cake is sure to win the heart of the receiver. Its a cream cake and irresistible taste can make anyone’s taste buds go crazy. The stunning beauty and its delicious taste are capable of dragging the attention of your crush and force her to say yes! So, go ahead and place your order now! You can also customize your cake according to your choice. Extra charges will be charged for the changes. To make it eggless, click on checkbox button. this was my first time that i ordered cake online and i must say winni did not dissappoint me at all...the service was very nice and fast ! !